0-4 for Michael Newman as Meath won tonight. 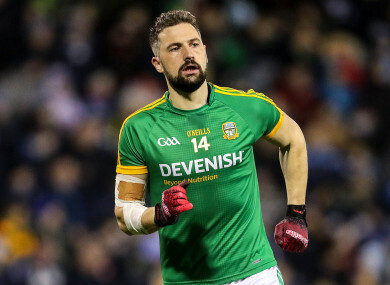 DIVISION 2 FOOTBALL league leaders Meath earned their third win of the campaign as scoring surge midway through the second half set them clear of Cork at Páirc Uí Rinn tonight. Having led by 0-6 to 0-5 at half-time, Meath pushed two clear on the resumption through Graham Reilly but, though Michael Hurley replied for Cork on 38, they wouldn’t score again until five minutes before the end of normal time. Meath scored 1-4 without reply in between as Thomas O’Reilly and the impressive Ciarán O’Sullivan got on the scoresheet and Michael Newman registered his fourth point before wing-back Gavin McCoy palmed home a goal. After Shane McEntee found Bryan McMahon, his pass allowed O’Sullivan to move into space and give McCoy an easy task, with Bryan Menton’s second point opening up an eight-point advantage. Cork did end their drought when sub Seán Powter got a goal, reaching a Mark Collins handpass across the square, and Collins had two points from frees as the gap was reduced to four, but Meath made sure of the win in injury time. Having forced a turnover, Newman was through on goal but he opted to give sub Barry Dardis an easy chance and netted from close range. In the first half, Meath had the better of the play, with Newman’s frees helping them to move four clear at two different stages, but McMahon should have had a goal and late points from Luke Connolly (two) and Conor Dennehy reduced Cork’s deficit. They never drew level though and Meath were stronger in the second half. Scorers for Meath: Michael Newman 0-4 (0-3f), Barry Dardis 1-1, Gavin McCoy 1-0, Ben Brennan (0-1f), B Menton 0-2 each, Graham Reilly, Cillian O’Sullivan, Thomas O’Reilly 0-1 each. Scorers for Cork: Seán Powter 1-0, Michael Hurley, Luke Connolly (0-1f), Mark Collins (0-2f) 0-2 each, Matthew Taylor, Ruairí Deane, Conor Dennehy 0-1 each. Email “Meath's Division 2 promotion bid still on track after six-point victory away to Cork”. Feedback on “Meath's Division 2 promotion bid still on track after six-point victory away to Cork”.